To survive and live well we must reduce our population back to 2 billion as it was 80 years ago. 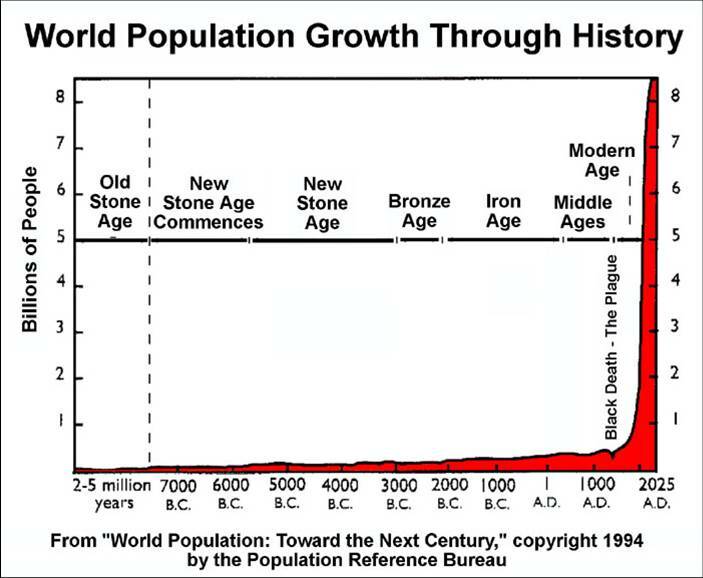 Why did we allow our world population to keep growing to an unsustainable 7.4 billion, and passing on to our children the task of feeding and managing 9 billion people on a planet of degrading soils, acidifying and rising oceans with a depleting fish stock, in a hostile climate, and with next to no affordable oil. We obviously don’t know what we’re doing. Nor do we care about the outcome of our present activities on our children when our precious ones’ time to take over that exhausted overpopulate polluted world. That’s criminally insane. On the other hand, our children are for us – average functioning parents – our prime consideration. But sadly, we can only imagine social interactions and activities for the future that are a part of civilisation past and present. We experienced no other; our social imagination was squeezed by our education. Thus we are ill equipped to deal with a completely new danger that’s so severe it could end life on our planet. It’s not a vision we can contemplate, but we owe it to all life. The ultimate way to reduce our footprint on the planet is to reduce our population, a near impossible task in any civilisations but particularly capitalist ones. It’s the reason it’s shelved before it’s planned, except for the cruel Chinese example. Nevertheless, it must be done if we are to survive. The obstacle preventing an effective reduction on a world scale is the socioeconomic system and the education formulated to be competitive in that system. However, we are genetically cooperative and adaptive. This can give us the ability to either, enhance nature’s health which in turn can secure our survival, or we can continue to exploit whatever is on the planet to be more competitive until we all perish. Surviving with an anticipated 9 billion of us within 4 decades time will need many sacrifices, considering how much more our planet will have degraded before we get honest information on our situation. It will require an incredible reduction in our consumption, energy use, with very supportive interactions instead of the competitive and combative ones we have. Also to achieve that radical reduced consumption, we must have a drastic decrease population, but neither can be achieved in a competitive setting. Therefore we must abandon the contradicting competitiveness of civilisation and turn back to our natural supportive and cooperative way of life on a world scale. We are by far the most adaptable life that ever lived on our planet, we start to adapt before we are born to the social culture our mothers lives in. So, we are a reflection of the society we were nurtured in, therefore, it takes a great deal of conscious effort and time to become aware of the deceitfulness and its resultant destructiveness of civilisation. Our competitiveness is so intense that it doesn’t allow us the time and mental effort to search outside the regular, so we rarely attempt it, and therefore many will succumb jeopardising our survival. Overcoming that individually amongst non-participating groups of ones fellows is overwhelming and will take too long to save our children. The people that can change the information, are the few billionaires, they are the one we should target, not as a foe but as partners in grave danger. Not all, powerful wealthy people are fanatical to the point of mass suicide, those that are, are likely to be inept. The ones with strong survival instinct can help to change public opinion, as the alternative for them and their offspring can’t be contemplated. What environmentalists and the Left have been doing is competing against the establishment to change peoples’ perception of the state of our planet, as it is and will affect us. Unfortunately, it’s an extremely one-sided competition and the outcome of that struggle may meet yesterday’s desires, but would finalise our fate. How can we manage to live in this quagmire? Can any civilised system save our children from extermination? The quick answer is, none of them can. Not even any modification of them at this stage. We got to bite the bullet; or more to the point, our wealthy 1% must. Our responsibility is to make sure those few wealthy individuals who have the power, but are not as yet aware of the fatal predicament they’re in, to see it. Only those who have the power can save themselves by saving as many of us with as much of our planet as possible. The threat to our planet’s life must be seen as a whole and not in the present disconnected way, as nature is connected in multitude of ways. The reductionist method has severe limitations, it’s very thorough, but narrow in its research is isolated from the other parts of nature, and this has given us a great deal of information with limited understanding. Yet we know that to understand a complex situation we need a wide ranging holistic approach. However, the socioeconomic system needs more of the same; not a greater questioning of the system as that will tend to divert our attention from boosting to economy. That may have been understandable 60 years ago, but today it’ll be disastrous. To survive, we will need a very efficient economic system that’s fair and satisfies everyone, therefore it will be peaceful. This will, in turn, allow us to cooperate for our survival. Our goal for the future must be to reduce population down to a few billion and only produce what will enhance our quality of life. To have the best possible life, we as the most social life form must start with the way we presently relate, and fix those relationships so as to conform with our nature instead of trying to exploit one another. We must realise that civilisation is about taking or controling as much territory as possible by whatever means. This is in stark contrast with Australian indigenous people, for example, according to Alan J. Cooper from the Centre for Ancient DNA. He states that 50,000 years ago, people settle all around the coast of Australia, going east and west and then inland, but once they settled in a territory, the descendants stayed. There were no invasions to take other people’s land in all that time. This contrasts with Eurasia, where people kept coming from Africa fighting for new land, while Australia was isolated and even more so as the oceans rose after the ice age, which was the critical invasion times . Once we convince the powers-that-be of their dire circumstances that their only chance of survival is to cooperate. The steps needed for our survival are simple and obvious; the difficulty is to convince the 1% that their life is at stake like everyone else. So we can have a common interest and we can stop competing and start those measures to save our children. Here are some obvious steps. § End military spending and actions as a priority and recycle the equipment. § Stop producing cars and concentrate on a public transport worldwide, mainly rail and shipping. § Reduce trade to the barest minimal and charge actual total cost of moving stuff around. Focus on local produce as much and quickly, as its socially acceptable. Air transport only for emergencies. § Free health care, education, local transport, basic healthy food, and housing for everyone. This is best done by local communities with people who know each other. Help should be on hand, if needed, for localities in trouble. § As costs of living is reduced, wages also can be lower, reducing the cost of providing services and allowing full participation (employment). That will mitigate higher energy cost set to reduce Greenhouse gas emissions. That’s less stuff, more and better services. § Split-up agribusiness to smaller units with more labour and less need of oil, synthetic fertilisers and pesticide. Permaculture as the way. § We desperately need to change the education to promote happiness through cooperative activities, as they enhance our feeling of wellbeing and security, tranquillity as a way of life. § The aim is to live within environmental constraints and have the most peaceful, fulfilling, and involved life with a large safety factor to cope with the unexpected. § Set up community of the ideal size, to give the most economical and satisfying life for all. § With the above societies we can easily reduce population to an ideal level quickly without stress, by discarding the nuclear family, which is structured to accumulate property or poverty. § A one to two billion population to allow for the best and safest life. This could be achieved relatively quickly with that kind of living arrangement without any undue stress. The aim must be to give the best life for all children. They would have multiple fathers and mothers, which would mitigate any odd behaviour, idiosyncrasies or pathological behaviour. § Gradually reduce the importance of private property to near zero and facilitate communal living in the largest efficient workable groups. That would enable all who are dependent, young or old; their welfare is the community’s responsibility and privilege. Every one regardless of age and ability must be enable to participate in the group’s economy. § One must consider that once our footprint on the planet had reached its maximum carrying capacity, more people means less per capita. Thanks for your comment, it’s reassuring to know there’s someone out there who is interested in what one says and you have commented many times on my stuff. I appreciate it. I agree with your comment but we need a strong motivation to do that. Unfortunately the trauma I experienced during my schooling has wreck the art that you’re talented in, so I can’t comment on your piece. I maintain we all do the best we can at all times. Our gene, our total nurturing from conception, our social setting and our individual experiences throughout life is what we are. So society must take the lion share of the way we behave either altruistically or selfishly, our gens can only moderate our behaviour. So here’s no need to punish, but mustn’t give opportunities for the selfish ones as we do now. For any societies to be sustainable they have to maintain their “development” in arthimetic progression however in capitalistic societies the so called development takes place at a frenzied pace in multiples i.e. in geometric progression and that’s how natural progression gets turned on its head and assumes the monstrosity of exploitation of scarce resources in the guise of development. “/overpopulation/” in connection with any Third World country. coloured graph of exponential growth. which I first published in 1993.